Are you a bagel lover who enjoys a toasted bagel in the morning or a hearty bagel sandwich for lunch? With so many flavors and styles to choose from, bagels are a convenient and versatile food. But bagel nutrition has changed over the years because of the way they are made. Be sure to check your favorite bagel calorie count before you build your meal. Most plain bagels are very low in saturated fat. They usually contain no cholesterol or sugar and are a good source of thiamin. Your bagel calorie count and nutrition can vary depending on the brand that you buy. For example, Lender's Plain New York Style Bagels (frozen) only provide 230 calories but are made with high fructose corn syrup. As a result, you'll consume 3 grams of sugar with each bagel that you eat. Another issue to think about when you buy a bagel is ​the size of the product. Bagels have gotten bigger over the years. According to the National Institutes of Health, 20 years ago a standard bagel was just 3 inches in diameter and had 140 calories. Now a typical plain bagel in many delis and bakeries can measure up to 6 inches in diameter and can add 350 calories to your daily calorie count. And even though many smart bagel eaters split the food with a friend, half bagel calories are now higher as well. Different varieties of bagels also provide different nutrition. For example, calories in a cinnamon raisin bagel are much higher because of the extra sugar and fruit. A cinnamon swirl and raisin bagel at Panera has 320 calories, 66 grams of carbohydrate and 11 grams of sugar. Savory bagels often don't fare any better. A cheddar pesto bagel at Bruegger's provides 420 calories, 10 grams of fat, and 9 grams of sugar. Your favorite bagel may be a source of refined carbohydrates. That means that the grains used to make the products have been processed by a food manufacturer so that the whole grain is no longer intact. The refining or milling process removes dietary fiber, vitamins, and minerals. In general, nutritionists recommend that you limit your intake of refined grains. You can usually tell if a food is refined if the label says that it is enriched. Enriched products are those that have had some nutrients added back in during production. But these foods are still often lacking fiber—an important nutrient in a balanced diet. What about whole wheat bagels? One whole wheat bagel is equivalent to eating about four to six slices of bread, which means it is very carbohydrate dense and can raise blood sugars. For that reason, they're not usually recommended for people with diabetes. Knowing that not all bagels are created equal, be mindful of the kind you're buying and its portion size. Ask about their freshness to be sure you're not buying day-old bagels (or older). When you do buy a few, keep them fresh by storing at room temperature in a plastic bag. You might think that refrigerating will make them last longer, but the opposite is usually true. You can freeze them for up to four months, however, and them warm them up in the oven when you're ready to enjoy them again. If you are trying to cut back on carbs or limit your intake of refined bread products, there are a few things you can do to make your bagel-based meal more healthy. Make an open-face sandwich. You don't have to use both halves of the bagel when you make a sandwich. Skip the upper part and simply top your bagel bottom with lean meats and veggies. Scoop out your bagel. If you like having both a top and a bottom bagel, then scoop out the middle. Use a spoon and remove the soft middle part. Build your sandwich around the bagel crust. Go whole grain. Even though whole wheat bagels still provide more calories and carbs, a whole grain choice is still better than a refined product because you get the dietary benefits of fiber. Watch for added sugar. Most sweet bagels will add to your sugar intake for the day. Check the ingredients and try to choose a bagel without corn syrup or other added sweeteners. Toppings matter. Even though bagel calories matter, the calories in your topping will add up as well. A bigger bagel will require more toppings, so watch what you layer on top. Skip the butter and the high-calorie cream cheese. Go for healthy veggies, hummus, or make a healthy bagel pizza with fresh ingredients. 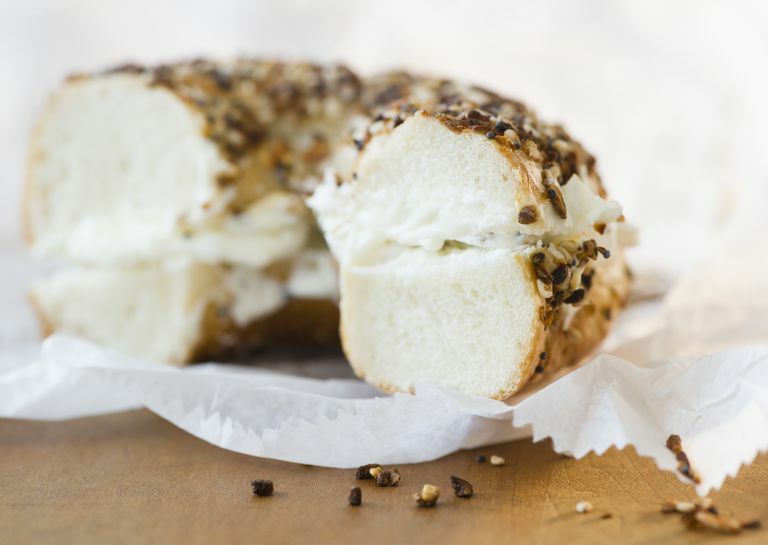 Bagels have landed on the no-no list for many diet-conscious eaters. But almost any food can be included in a nutritious diet if you eat it in moderation and include it in a comprehensive plan for healthy living. Keep bagels on the menu at your house if you enjoy them. Balance the bagel with other nutritious foods that include fiber, protein, and healthy fats to keep your smart eating plan on track.